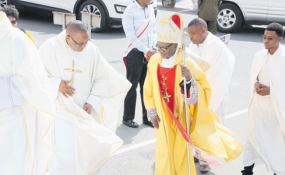 The Archbishop of Dar es Salaam, Polycarp Cardinal Pengo, is accompanied by priests during a procession to St Joseph Cathedral in Dar es Salaam where he led Christmas Eve mass. Clerics yesterday voiced their concern about what they said was a sharp increase in violation of people's basic rights. Delivering Christmas sermons across the country, they said that the situation was tarnishing the country's image. They were particularly vocal about the mysterious disappearance of people and the crackdown on freedom of expression. The Presiding Bishop of the Evangelical Lutheran Church in Tanzania (ELCT), Dr Fredrick Shoo, said Tanzanians were living in fear of the consequences of "saying the wrong things". Speaking during Christmas service at Moshi Lutheran Church, he said people were now afraid of speaking the truth, fearing that it could be viewed as criticism. Dr Shoo, who is also the bishop of the Lutheran Diocese of Moshi, said: "There is a group of people whose duty is to instil fear in people who speak the truth. This is wrong. Jesus was born to enable us live in truth and not in fear." He urged believers to stick to the truth and defend the truth without fear. The Bishop of the Morogoro Catholic Diocese, Telesphore Mkude, said the right of Tanzanians to live in their country in peace must not be infringed. Speaking to The Citizen after presiding over Christmas Mass at St Patrick's Cathedral in Morogoro, Bishop Mkude said every law-abiding Tanzanian deserved to be protected. He added that the trend whereby people vanished after being abducted by "unidentified individuals" risked tarnishing the image of security agencies particular and the government in general. "If high-profile individuals, including journalists, disappear without a trace, imagine what can happen to ordinary people. "The kidnapping of journalists is very dangerous for the wellbeing of any nation. Journalists play a very important role in informing and education society as well as helping the government to see where things go wrong. Why should they be treated as enemies?" Bishop Mkude queried. He advised journalists to observe professionalism and stick to the truth to avoid giving people of ill-will reason to harm them. "Let everyone in this country enjoy their inalienable right to live in peace and also the right to protection." Elsewhere, Polycarp Cardinal Pengo urged Tanzanians to support President John Magufuli's efforts to bring development in the country by working hard. He said in his Christmas Eve sermon at St Marcus Church in Kurasini Parish, Dar es Salaam, that Tanzanians should work hard without complaining. "The time has come for Tanzanians to work hard, day and night, to support President Magufuli's efforts," he said. In Shinyanga the Bishop of the Evangelical Lutheran Church in Tanzania (ELCT), East of Lake Victoria Diocese, Andrew Gulle, said in his Christmas Eve sermon that Tanzanians should treat others the same way that they themselves would like be treated. "Whatever is hurtful to you, do not do to any person...immorality will decline when people love each another as brothers and sisters," he said. In Dodoma the Anglican Bishop of the Diocese of Central Tanganyika, Dr Dickson Chilongani, urged leaders to emulate Jesus' humility by listening to the people. "We have leaders who behave like masters. They do bother to go the people and listen to their problems. They expect to be treated like masters by the people. They must change," he said.